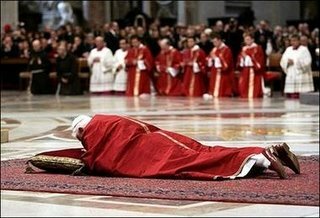 This is the "new" feast of St. Pius V...rumor has it that on the "traditional" feast date (later this week that the motu proprio on the Tridentine Mass will be released). For all of you who don't understand (attention media types), Amy has prepared a Motu Proprio Tip Sheet. I consider myself something of an expert on this matter, having migrated from the North (where the Church was receeding) to the South in 1976 when the Church was still very much a minority player in the south. I watched this expansive growth that largely took place after Vatican II--and therefore was truly a "Vatican II" church, not as much the renovation church of the North. A Southerner who moved North 15 years ago to assume the job of associate publisher at Our Sunday Visitor Publishing House in Huntington, Indiana, Msgr. Owen Campion has a clear perspective on differences between the Northern and Southern Church. His family goes back generations in Nashville, Tennessee, where he used to edit the diocesan newspaper, The Tennessee Register. The city of Nashville is now five percent Catholic, but was only two percent Catholic when he was growing up, he tells me in a phone interview last January. But there the Catholic Church provided a protective, closed system of its own. Because his family knew the families of the priests and nuns, as a young man he was never afraid of them. He says he could always separate their personality from their role. Msgr. Campion remembers an incident when he first started serving Mass in sixth or seventh grade at his parish. The servers were new and “the boy beside me and I didn’t know what to do next, bring up the cruets or the Latin responses or whatever. We started whispering back and forth. After Mass, the celebrant, who was recently ordained, just exploded at us. He told us our constant talking had been so distracting that he had almost forgotten where he was, that this was so disrespectful. I went home really shaken. Msgr. Campion went on to college at St. Bernard Abbey in Cullman, Alabama, where about 30 percent of the students came from Tennessee and about 30 percent from Alabama, and then to St. Mary’s Seminary near Baltimore to study for the priesthood. At that time St. Mary’s had more than 20 students from Tennessee. He was ordained in 1966. On the plus side, he notes that the Franciscans often served parishes peopled by blacks. He has high praise for Archbishop James F. Lyke, O.F.M., of Atlanta, one of the first African-American bishops, who died in 1992. I've hit a bump in the road...mainly being on the road for over a week. I was able to record the readings throughout my time away, but alas I haven't been able to do the next week as I'm way behind on a number of things including sleep. So I think, I'll start working on getting everything going in a few days--but none for most of this week. Sorry. Its the first time I've walked into a Catholic bookstore and seen one of my books featured...and praised. The manager was effusive with her praise (and she didn't even know that I was the author)! Its an Metrolink train, right off the beach on the Pacific Ocean. Yesterday the Vicar General of the St. Petersburg Diocese gave me a short tour of a truly unique church (in Florida anyways). St. Mary's. Even though I'd been to St. Petersburg quite a few times, I'd never noticed this beautiful church before. I also made a visit to the Cathedral bookstore--where the bookstore manager told me how much she loved one of Our Sunday Visitor's new books and couldn't keep it on the shelves. The book? "A Pocket Guide to the Mass" She was surprised when I told her that I was the author. On another front, I received an email from a teacher in Iowa yesterday who said that she is using The How to Book of the Mass with her youth group. They talked about one section of it last night and said that the kids were the most interested they have ever been about any subject--the session ran an hour over! I made a quick visit to my parents last night in upper Florida. My brother in law made an early bold prediction that Kentucky will beat Florida in football (he's from Kentucky). 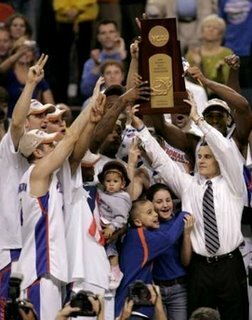 Since he and my sister moved to Florida--the Gators have won three national champions....and the last time that we were in Lexington together the Gators were actually losing 21-0 in the fourth quarter (the Zook era)but ended up winning...I reminded him of that...we'll see. Meanwhile, I'm tired of being on the road. Our catechetical journey through the early Church brings us to the remarkable figure of Origen of Alexandria. This great teacher of the faith was highly esteemed by his students not only for his theological brilliance, but also for his exemplary moral conduct. His father, Leonides, was martyred during the reign of Septimius Severus. Though Origen himself always had a deep yearning to die a martyr’s death, he decided that the best way to honour his father and glorify Christ was by living a good and upright life. Later, under the emperor Decius, he was arrested and tortured for his faith, dying a few years later. Origen is best known for his unique contribution to theology: an "irreversible turn" which grounded theology in Scripture. He emphasized an allegorical and spiritual reading of the word of God, and demonstrated how the three levels of meaning—the literal, the moral, and the spiritual—progressively lead us to a deeper prayer life and closer relationship with God. Origen teaches us that when we meditate on God’s word and conform our lives to it, we allow the Holy Spirit to guide us to the fullness of truth. May we follow Origen’s example by praying with scripture, always listening attentively to God’s word. One wonders if the pope sees in his election as pope a similar path when he says this of Augustine's ordination "The beautiful dream of the contemplative life disappeared, Augustine's life fundamentally changed. Now he had to live with Christ for all." No Bavarian retreat to contemplate the truth, but a mission to share the truth to the world! Benedict XVI illustrated Augustine's path to conversion, recalling the "three conversions" that the saint experienced, which "in fact were a single great conversion in seeking the face of Christ and then walking together with him." "The first fundamental conversion was the interior road to Christianity, toward the 'yes' of faith and baptism," he explained. According to some historians, Augustine's baptism took place on Easter in 387. Augustine "was always tormented by the question of truth. He wanted to find truth," the Holy Father explained. "He always believed -- sometimes rather vaguely, sometimes more clearly -- that God exists and takes care of us," the Pontiff said. "But to truly know this God and Jesus Christ and come to say 'yes' to him with all the consequences this entails -- this was the great interior struggle of his youth. "He tells us that, by means of Platonic philosophy, he accepted and recognized that 'in the beginning was the Word,' the Logos, creative reason. But philosophy did not show him any road to reach this Word; this Logos remained distant and intangible. "Only in the faith of the Church did he find the second essential truth: The Word was made flesh. And in this way he touches us and we touch him." Augustine's "second conversion" took place after his baptism in Hippo, in Africa; he founded a small monastery and by popular demand was ordained a priest by force, the Pope explained. Benedict XVI continued: "The beautiful dream of the contemplative life disappeared, Augustine's life fundamentally changed. Now he had to live with Christ for all. "He had to translate his knowledge and sublime thoughts into the thought and language of the simple folk of his city. "The great philosophical work of a lifetime, which he had dreamed of, remained unwritten. In its place we were given the gift of something more precious: the Gospel translated into the language of daily life." "This was the second conversion that this man, struggling and suffering, had to undergo," the Pope added. "He must always be there for everyone; always with Christ he must give his own life so that others might find Christ, the true Life." St. Augustine's third conversion took place when he discovered that "only one is truly perfect and that the words of the Sermon on the Mount are completely realized only in one person: in Jesus Christ himself," the Holy Father said. He added: "On the other hand, the whole Church -- all of us, including the apostles -- must pray every day: Forgive us our trespasses as we forgive those who trespass against us, St. Augustine wrote. "Augustine saw the final step of humility -- not only the humility of inserting his great thought into the faith of the Church, not only the humility of translating his great knowledge into the simplicity of proclamation, but also the humility of recognizing that the merciful goodness of a God who forgives was necessary for him and the whole pilgrim Church. "And we make ourselves resemble Christ, the perfect one, to the greatest extent possible, when we become merciful persons like him." Benedict XVI concluded with this exhortation: "In this hour let us thank God for the great light that radiates from the wisdom and humility of St. Augustine and let us pray to the Lord that he give all of us the necessary conversion each day and thus lead us to the true life." I went to Mass here last night...St. Edward the Confessor. I am speaking at this event to promote The Gift of Faith by Father Tadeusz Dajczer tommorrow. For more infomation go here. 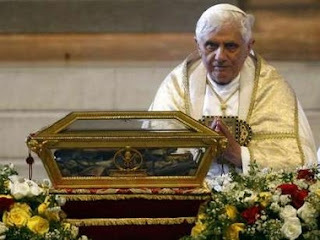 Two Petrine occasions being lived together as a single intense celebration: The joy of the People of God over the 80th birthday of Benedict XVI continued and was manifest yesterday on a sunny spring morning at the General Audience, on the eve of the second anniversary of his Pontificate. A spring that is not only 'metereological' but above all, spiritual and ecclesial, enveloped St. Peter's Square with its radiant light. A spring that pulsated with faith and interior joy on this particular Wednesday, still resounding with the loving wishes of all around the world who wished him Happy Birthday and the tens of thousands of pilgrims who had come again to be near the Successor of Peter, honoring him with overflowing filial affection. Spring is the climate in St. Peter's Square where more than ever today, the heart of the Church beats. Springlike are the colors on the Square which are a palette of the variegated liveliness of the faithful in all their affection and warmth. 'Let us praise and thank God for the gift of Papa Benedetto' says one of the many many streamers enthusastically raised on the Square. A few words with the simple and boundless echo of a universal prayer. And springlike is the spirit of youthful freshness with which the Pope is experiencing these days. Springlike is this season of his heart and his life. Springlike is the spirit of this '80-year-old youth' who - with the gentle smile and sense of fatherhood that he conveyed to the world from the first day of his pontificate - has guided the helm of Peter's boat without sparing himself. "Most beloved Holy Father, we are with you always with joy and love in the vineyard of the Lord", another streamer reads. The prayerful affection of a celebratory people accompanies the intrepid Helmsman of the Church at every step along his way. Wolfgang Beinert, parish priest of Pentling,has a theory. "The Pope at 80 is in excellent form because he feels that he is loved." 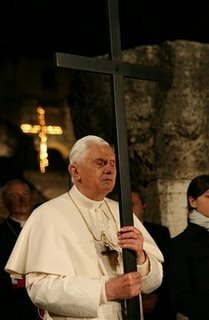 Beinert, who was once a student and then a university assistant to Joseph Ratzinger, says Benedict draws real joy from the office he performs and the goodwill and affection that the faithful give him. 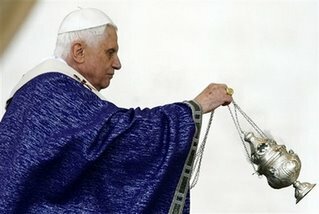 Beinert is right that the people love the Pope. More than that, they celebrate him. And yet, when he was elected two years ago, no one expected anything like this. 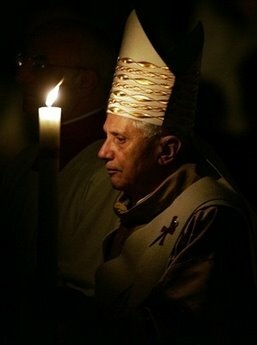 Cardinal Ratzinger had the reputation of a backward-looking Catholic and his name was a symbol for conservatism. How will he deal with people, many asked. And what about the media? But as if he had become another man altogether overnight, Benedict became almost from the very beginning, a cult figure. A million youth celebrated him in Cologne in Augustt 2005. A teenage magazine distributed a poster that said BENEDICT SUPERSTAR. A year later, Germany celebrated his homecoming to Bavaria. More TV cameras were set up in Bavaria than for the World Cup championships a few months earlier. Never were a Pope's words so omnipresent in Germany. His books, and books about him, fill the best-seller lists. 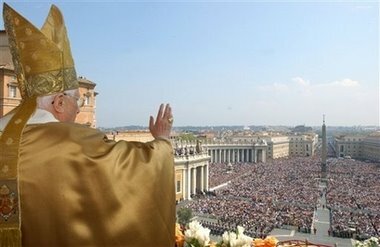 In the past year, Benedict attracted almostt 4 million people to St. Peter's Square, easily double the figure drawn by his predecessor at the height of his popularity. Perhaps even more important, since Benedict became Pope, the number of Catholics leaving the Church inGermany has dropped, while the humber of converts and returnees is rising. Marktl, the little town where he was born, is all abuzz. Bakeries still turn out marzizpan miters and Benediktschnitten (cake). Visitors from Italy and Poland come away with bonbonnierres with the Pope's face on it, as it is on glasses and on souvenir spoons. Devotional stores do booming business. The town square, where the Holy Father stepped down last September to greet the people, has a four-meter bronze Benedict-pillar showing scenes of his life, and his saying, "he who believes is never alone, in life or in death." Marktl now has eight bus parking lots, 15 new work-generating business enterprises and a four-language Internet center. But the whole of Bavaria has seen a rise in tourism - 100,000 more visitors last year than in 2005. The Marian shrine at Altoetting has seen 20 million pilgrims this year, about 10% more than at any time in the past 10 years. "Some visitors stand before the baptismal font where the Pope was baptized and weep," says one tour operator. The 'birth house' will now be a community cente, where people can meet, pray and engage in social activities. Monday morning, to mark the Pope's birthday, parish priest Josef Kaiser was scheduled to say a prayer in the room where the Pope was born at the exact time he was born, 4:18 A.M. and then lead a candelight procession to St. Oswald where he was baptized. I'm on a Sharathon this morning on Redeemer Radio, you can listen live and donate....please do! Heidi Hess Saxton has the news. In the "strange" department, I was thinking of Anthony Benkovic last night, right after dinner and went up to my office and spent several moments checking out Johnnette's web sites to see if there were any updates. I found none and didn't find any news from this month about him on the blogs either, but then I thought Heidi Saxton would know, so I searched for her blog and alas no news there either. This morning I had a note from Heidi saying that he had died last night around 7:00 p.m.--right about the time I had been searching her blog for information about his status. I'd been praying, as others have for the intercession of Archbishop Fulton Sheen for Anthony's healing, but alas he has received the final healing--the one we celebrate this week--the Octave of Easter. Eternal Rest Grant onto him, O Lord and let perpetual light shing upon him, Amen. Please pray for Johnnette and her daughters as they grieve their great loss. Several prominent scholars who were interviewed in a bitterly contested documentary that suggests that Jesus and his family members were buried in a nondescript ancient Jerusalem burial cave have now revised their conclusions, including the statistician who claimed that the odds were 600:1 in favor of the tomb being the family burial cave of Jesus of Nazareth, a new study on the fallout from the popular documentary shows. The Italian daily Il Tempo has published an unsigned article claiming in the headline that the Motu Proprio will be issued next Monday, 16 April, after the celebration for the Holy Father’s 80th Birthday. In this Easter Octave, the liturgy speaks to us of the appearances of the Risen Lord to the disciples. The Fathers of the Church give us many valuable insights into these stories, which help us to understand more profoundly the great truth of the Resurrection. When Peter and John go running to the tomb, each trying to arrive there first, they show us the one form of competition that is legitimate between believers: zeal in the search for Christ. The disciples on the road to Emmaus recognize the Lord because they see him at table with them. We recognize him, because we are granted an even more intimate encounter with him: we see him in our hearts. 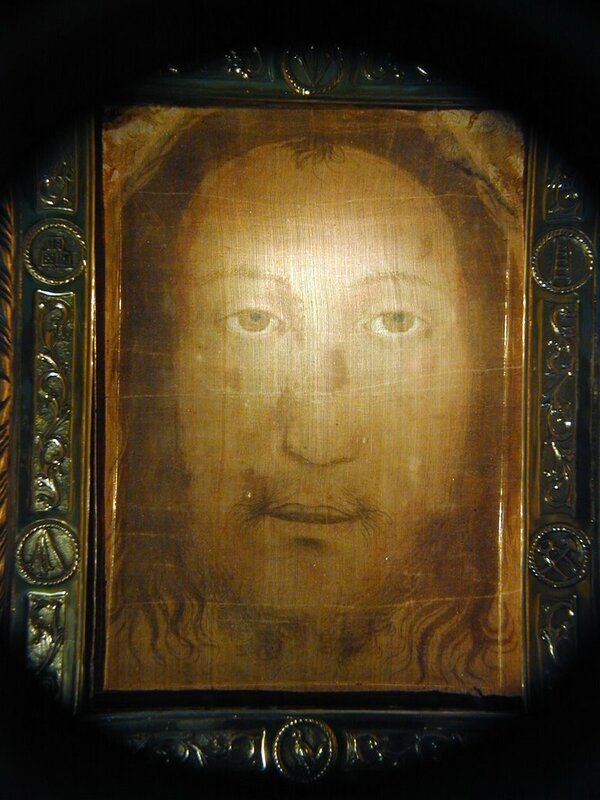 To Mary Magdalen, the Lord says: Do not touch me, because I have not yet ascended to the Father. This is surprising, since to Thomas, he actually says: "Put your finger here, place your hand in my side." But there is an important difference here. Mary Magdalen wanted to embrace the Lord as if nothing had happened, as if he had returned to the same life that he had lived before. No, he has passed through death to a new life, and the wounds of his Passion are the sign of that definitive victory over death. I greet all the English-speaking visitors present at today’s Audience, including the groups from Britain and Ireland, Sweden, Australia and the United States. I extend a special welcome the newly ordained deacons and the Golden Jubilarians from Ireland. I pray that the Risen Lord will fill your hearts with joy and that he will inspire you to proclaim to the world the good news of the Lord’s Resurrection! Happy Easter to you all! The 70-year-old George, who fell Saturday at a Northwest Side church, said he expects to recover from a fractured femur in about six to eight weeks. The spiritual leader of Chicago Roman Catholics worked Monday from his residence on North State Pkwy., said Archdiocese of Chicago spokesman James Accurso. In a radio interview, George lamented that the fall caused him to miss Easter mass at the cathedral for the first time in 10 years. He was blessing children's Easter baskets at St. Ferdinand parish when "I got some water on the marble floor and I slipped,'' he told WGN-AM. The Pontiff brought his short reflection to a conclusion by highlighting the Easter joy of Mary, Mother of Jesus, who is a pillar for Christians and their mission. For more on the Georgia Martyrs, visit the Friends of the Georgia Martyrs site. Friar Pedro de Corpa had spent a decade before his death in the late 16th century as a missionary converting Indians to Christianity in Spanish Florida, which then included the 100-mile Georgia coast. De Corpa was assigned to a mission near present-day Darien, Ga., when he infuriated the nephew of a Guale chieftain who planned to take a second wife. The friar admonished the nephew, a baptized Christian named Juanillo, and told him polygamy violated God's law. On Sept. 14, 1597, Juanillo led warriors smeared in war paint to de Corpa's hut, where he was preparing for morning Mass. They killed the friar with stone clubs, severed his head and displayed it on a pike by a nearby river landing.The warriors killed four more friars - Blas Rodriguez, Miguel de Anon, Antonio de Badajoz and Francisco de Verascola - at St. Catherines Island and other nearby missions over the next several days. Friar Pedro Fernandez de Chozas wrote to the Spanish governor at St. Augustine, Fla., on Oct. 4, 1597: "How they must have been lonely, Senor General, these little lambs, at the moment of martyrdom." Beatification by the church, a lengthy process likely to take many years, would entitle the five friars to be called "blessed." But it requires proof of a miracle or martyrdom, meaning they died willingly at the hands of religious persecutors. Harkins said it should be "an open and shut case. "If he's right, the friars would join a very short list of only three Christians the church recognizes as having been martyred within U.S. borders - fewer than half the number of U.S. saints. The U.S. can claim just eight Catholic saints. Among them are the only beatified martyrs slain on American soil: three Jesuit priests killed in the 1640s by Iroquois Indians near present-day Auriesville, N.Y.
"In North America, we haven't had periods of persecution," said Lawrence Cunningham, a University of Notre Dame theology professor and author of the book A Brief History of Saints. "You're not going to find any martyrs in the U.S. after the period of early exploration." On KVSS in Omaha, NE...you can listen on their website. I'll be on at 9:00 A.M. Eastern time, 8 Omaha time. Dear Brothers and Sisters throughout the world,Men and women of good will! Christ is risen! Peace to you! Today we celebrate the great mystery, the foundation of Christian faith and hope: Jesus of Nazareth, the Crucified One, has risen from the dead on the third day according to the Scriptures. We listen today with renewed emotion to the announcement proclaimed by the angels on the dawn of the first day after the Sabbath, to Mary of Magdala and to the women at the sepulchre: “Why do you search among the dead for one who is alive? He is not here, he is risen!” (Lk 24:5-6). It is not difficult to imagine the feelings of these women at that moment: feelings of sadness and dismay at the death of their Lord, feelings of disbelief and amazement before a fact too astonishing to be true. But the tomb was open and empty: the body was no longer there. Peter and John, having been informed of this by the women, ran to the sepulchre and found that they were right. The faith of the Apostles in Jesus, the expected Messiah, had been submitted to a severe trial by the scandal of the cross. At his arrest, his condemnation and death, they were dispersed. Now they are together again, perplexed and bewildered. But the Risen One himself comes in response to their thirst for greater certainty. This encounter was not a dream or an illusion or a subjective imagination; it was a real experience, even if unexpected, and all the more striking for that reason. “Jesus came and stood among them and said to them, ‘peace be with you!’” (Jn 20:19). At these words their faith, which was almost spent within them, was re-kindled. 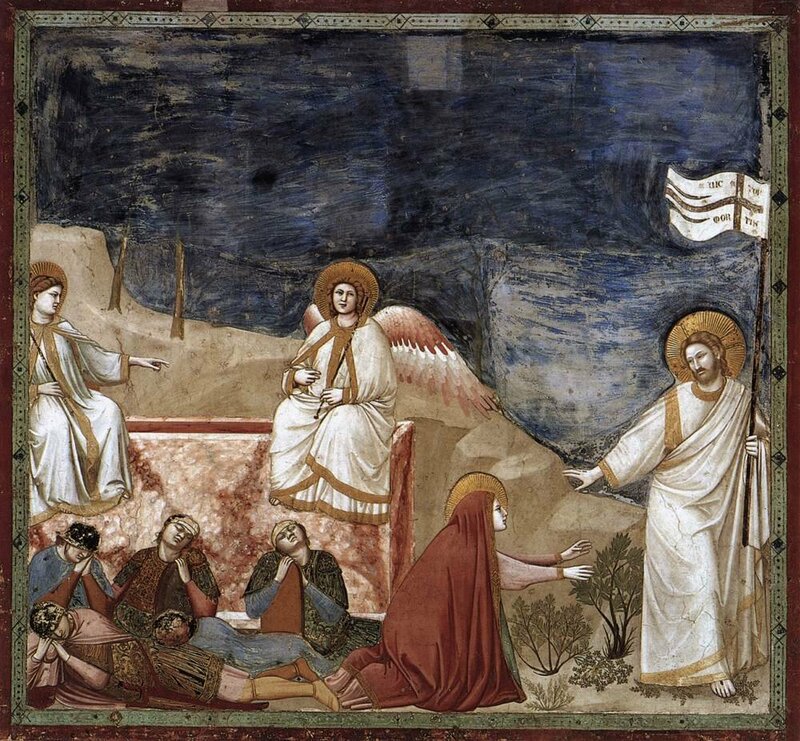 The Apostles told Thomas who had been absent from that first extraordinary encounter: Yes, the Lord has fulfilled all that he foretold; he is truly risen and we have seen and touched him! Thomas however remained doubtful and perplexed. When Jesus came for a second time, eight days later in the Upper Room, he said to him: “put your finger here and see my hands; and put out your hand and place it in my side; do not be faithless, but believing!” The Apostle’s response is a moving profession of faith: “My Lord and my God!” (Jn 20:27-28). “My Lord and my God!” We too renew that profession of faith of Thomas. I have chosen these words for my Easter greetings this year, because humanity today expects from Christians a renewed witness to the resurrection of Christ; it needs to encounter him and to know him as true God and true man. If we can recognize in this Apostle the doubts and uncertainties of so many Christians today, the fears and disappointments of many of our contemporaries, with him we can also rediscover with renewed conviction, faith in Christ dead and risen for us. This faith, handed down through the centuries by the successors of the Apostles, continues on because the Risen Lord dies no more. He lives in the Church and guides it firmly towards the fulfilment of his eternal design of salvation. We may all be tempted by the disbelief of Thomas. Suffering, evil, injustice, death, especially when it strikes the innocent such as children who are victims of war and terrorism, of sickness and hunger, does not all of this put our faith to the test? 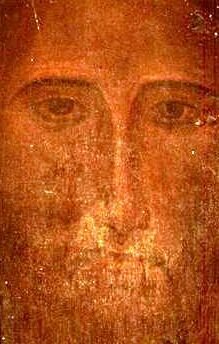 Paradoxically the disbelief of Thomas is most valuable to us in these cases because it helps to purify all false concepts of God and leads us to discover his true face: the face of a God who, in Christ, has taken upon himself the wounds of injured humanity. Thomas has received from the Lord, and has in turn transmitted to the Church, the gift of a faith put to the test by the passion and death of Jesus and confirmed by meeting him risen. His faith was almost dead but was born again thanks to his touching the wounds of Christ, those wounds that the Risen One did not hide but showed, and continues to point out to us in the trials and sufferings of every human being. “By his wounds you have been healed” (1 Pt 2:24). This is the message Peter addressed to the early converts. 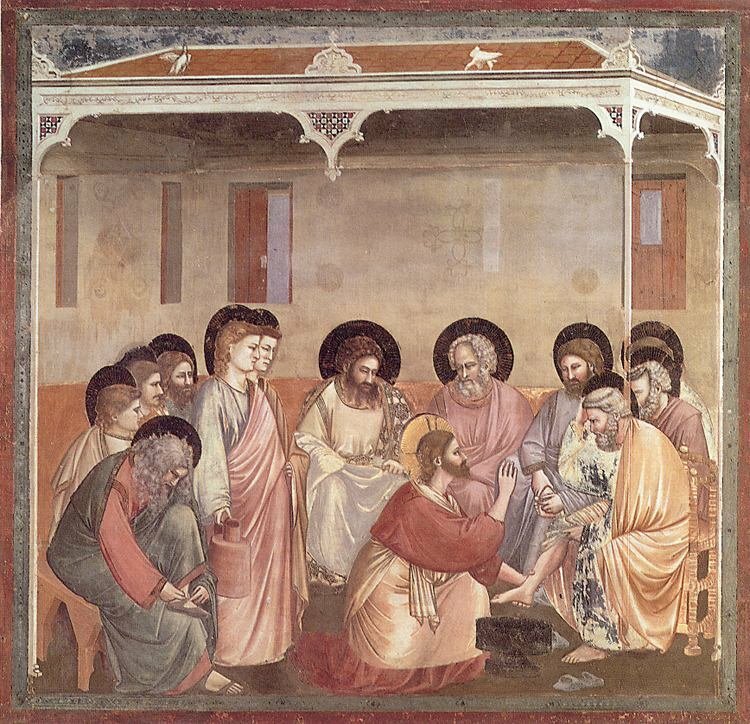 Those wounds that, in the beginning were an obstacle for Thomas’s faith, being a sign of Jesus’ apparent failure, those same wounds have become in his encounter with the Risen One, signs of a victorious love. These wounds that Christ has received for love of us help us to understand who God is and to repeat: “My Lord and my God!” Only a God who loves us to the extent of taking upon himself our wounds and our pain, especially innocent suffering, is worthy of faith. How many wounds, how much suffering there is in the world! Natural calamities and human tragedies that cause innumerable victims and enormous material destruction are not lacking. My thoughts go to recent events in Madagascar, in the Solomon Islands, in Latin America and in other regions of the world. I am thinking of the scourge of hunger, of incurable diseases, of terrorism and kidnapping of people, of the thousand faces of violence which some people attempt to justify in the name of religion, of contempt for life, of the violation of human rights and the exploitation of persons. I look with apprehension at the conditions prevailing in several regions of Africa. In Darfur and in the neighbouring countries there is a catastrophic, and sadly to say underestimated, humanitarian situation. In Kinshasa in the Democratic Republic of the Congo the violence and looting of the past weeks raises fears for the future of the Congolese democratic process and the reconstruction of the country. In Somalia the renewed fighting has driven away the prospect of peace and worsened a regional crisis, especially with regard to the displacement of populations and the traffic of arms. Zimbabwe is in the grip of a grievous crisis and for this reason the Bishops of that country in a recent document indicated prayer and a shared commitment for the common good as the only way forward. Likewise the population of East Timor stands in need of reconciliation and peace as it prepares to hold important elections. Elsewhere too, peace is sorely needed: in Sri Lanka only a negotiated solution can put an end to the conflict that causes so much bloodshed; Afghanistan is marked by growing unrest and instability; In the Middle East, besides some signs of hope in the dialogue between Israel and the Palestinian authority, nothing positive comes from Iraq, torn apart by continual slaughter as the civil population flees. In Lebanon the paralysis of the country’s political institutions threatens the role that the country is called to play in the Middle East and puts its future seriously in jeopardy. Finally, I cannot forget the difficulties faced daily by the Christian communities and the exodus of Christians from that blessed Land which is the cradle of our faith. I affectionately renew to these populations the expression of my spiritual closeness. Dear Brothers and sisters, through the wounds of the Risen Christ we can see the evils which afflict humanity with the eyes of hope. In fact, by his rising the Lord has not taken away suffering and evil from the world but has vanquished them at their roots by the superabundance of his grace. He has countered the arrogance of evil with the supremacy of his love. He has left us the love that does not fear death, as the way to peace and joy. “Even as I have loved you – he said to his disciples before his death – so you must also love one another” (cf. Jn 13:34). Brothers and sisters in faith, who are listening to me from every part of the world! Christ is risen and he is alive among us. It is he who is the hope of a better future. As we say with Thomas: “My Lord and my God!”, may we hear again in our hearts the beautiful yet demanding words of the Lord: “If any one serves me, he must follow me; and where I am, there shall my servant be also; if any one serves me, the Father will honour him” (Jn 12:26). United to him and ready to offer our lives for our brothers (cf. 1 Jn 3:16), let us become apostles of peace, messengers of a joy that does not fear pain – the joy of the Resurrection. May Mary, Mother of the Risen Christ, obtain for us this Easter gift. Happy Easter to you all. "Following Jesus on the way of His Passion," the Pope said, "we see not only His passion but that of everyone who suffers in the world. This is the profound intention of the prayers of the Via Crucis - to open our hearts and help us see with the heart." The Fathers of the Church, said the Pope,"considered that the greatest sin of the pagan world was insensitivty and hardness of heart. That is why they loved the prophet Ezekiel, who said, 'I will take away your heart of stone and give you a heart of flesh.'" To convert to Christ, he said, meant "to receive a heart of flesh, sensitive to the passion and suffering of others." "
Our God is not a remote God, who is untouchable in His beatitude. He has a heart of flesh, He took on flesh precisely to be able to suffer with us and be with us in our sufferings. He became man to give us a heart of flesh and reawaken in us the love for the suffering and the needy." I could be wrong, but the carpet looks much like the one that Pope John Paul's coffin rested on at his funeral. 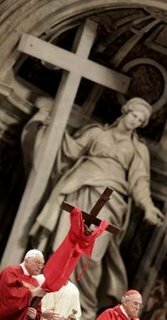 St. Faustina recounts that Jesus asked not only for a Feast of Divine Mercy, which the Servant of God, Pope John Paul II declared during his pontificate (and ironically died on two years ago on April 2nd--the Feast is movable, this year will be celebrated on April 15th), but also that Our Lord asked that a novena (nine days of prayer) to be prayed by the faithful starting on Good Friday and ending on the Feast of Divine Mercy (the Second Sunday of Easter). I explain the history of this novena as well as include the prayers for it in The Church's Most Powerful Novenas . Thankfully, you can now search inside this book to sample not only that novena, but other unique novenas such as Mother Teresa's "express or quick novena"--when you don't have nine days to wait for an answer (like all the novenas in the book the history behind it is also included). The Divine Mercy Novena is a beautiful way to begin the Easter season by reflecting upon the great love that God has for us, expressed by Jesus on the cross. The prayers dictated to St. Faustina by Jesus--express His love for all of us for whom He died and reminds us that none of us, no matter how far we think we have fallen are outside of the reach of His love, forgiveness--His Mercy. It was merely a rocky spur, called Golgotha in Aramaic and, in Latin, Calvary, “the Skull”, perhaps because of its physical appearance. On that peak rise three crosses, the crosses of men sentenced to death, two “criminals”, probably anti-Roman revolutionaries, and Jesus. The last hours of Christ’s earthly life begin, hours marked by the rending of his flesh, the dislocation of his bones, progressive asphyxia, interior desolation. These are hours that demonstrate the complete solidarity of the Son of God with human beings who suffer and slowly die. A poet once said: “The thief on the left and the thief on the right / felt only the nails driven into their hands. / But Christ felt the pain offered for salvation, / his side torn open, his heart run through. / It is his heart that burned. / His heart consumed by love.” Truly, all around that cross there seem to echo the words of Isaiah: “He was wounded for our transgressions, he was bruised for our iniquities; upon him was the chastisement that made us whole, and with his stripes we are healed. He makes himself an offering for sin”. The outstretched arms of that mangled body want to draw to themselves the entire horizon, embracing humanity, “as a hen gathers her brood under her wings”. For this was his mission: “When I am lifted up from the earth, I will draw all men to myself”. Beneath that dying body files the crowd, anxious to “view” a ghastly spectacle. It is a scene of superficiality, crass curiosity, thrill-seeking. A picture in which we can also see a society like our own, which looks for stimulation and excess as if they were a kind of drug capable of arousing a sluggish soul, an unfeeling heart, a darkened mind. Beneath that cross there is also cold hard cruelty, that of the leaders and the soldiers who in their ruthlessness are even capable of profaning suffering and death by their mockery: “If you are the King of the Jews, save yourself!” They are unaware that their words of sarcasm and the official title above the cross – “This is the King of the Jews” – are full of truth. Certainly, Jesus does not come down from the cross in a sudden dramatic turnabout: he does not desire servile obedience based on miracles, but a faith that is free, a love that is authentic. And yet, in his abject humiliation and in the very powerlessness of his death, he opens the door to glory and life, and reveals himself as the true Lord and King of history and of the world. Jesus, probably “celebrated the Passover without the lamb” , in so far as the Last Supper may have taken place before the moment in which , according to Hebrew tradition the lambs were sacrificed, and above all because He himself became the voluntary sacrificial victim, by offering His life as a gift for the salvation of mankind. 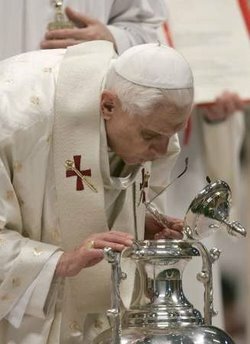 These reflections on the how and when the Last Supper took place, coupled with others on the meaning and value of the celebration, featured in the Pope’s celebration of the “In Coena Domini” Mass, which took place this evening in the basilica of St John Lateran, during which Benedict XVI carried out the rite of the washing of the feet. Benedict XVI’s commemoration of Our Lord’s Last Supper, which opens the Easter Tridium, re-evoked the Jewish tradition of Passover, “a celebration of thanksgiving and at the same time of hope. At the centre of the memorial feast, ordered according to strict liturgical rules, was the lamb as a symbol of liberation from the slavery of Egypt”. Yet still, “the nation suffered as a small population caught up in the tensions between great powers. Their grateful memorial of God’s intervention on their behalf in the past, transformed itself into a pleading prayer and expression of hope; come and bring to an end what you have begun! Gift us ever lasting freedom. The night before his passion Christ shared this feat of multiple meanings with his disciples. In this context we must understand the new Easter, which he gifted to us in the Blessed Sacrament”. The theologian Pope then recalled that “In the evangelist’s accounts of this event there seems to be a contradiction between the version as told by John and those of Mathew, Mark and Luke. 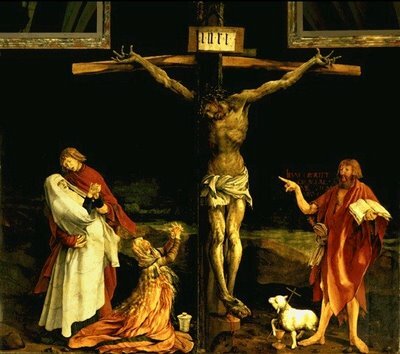 According to John, Christ died on the cross at the exact moment when in the temples nearby, the lambs were being slaughtered for the Pascal feast. His death coincides with the sacrifice of the lambs. That however means that he died on the eve of Passover and therefore could not personally celebrate the Pascal feast – this at least is what seems to be. 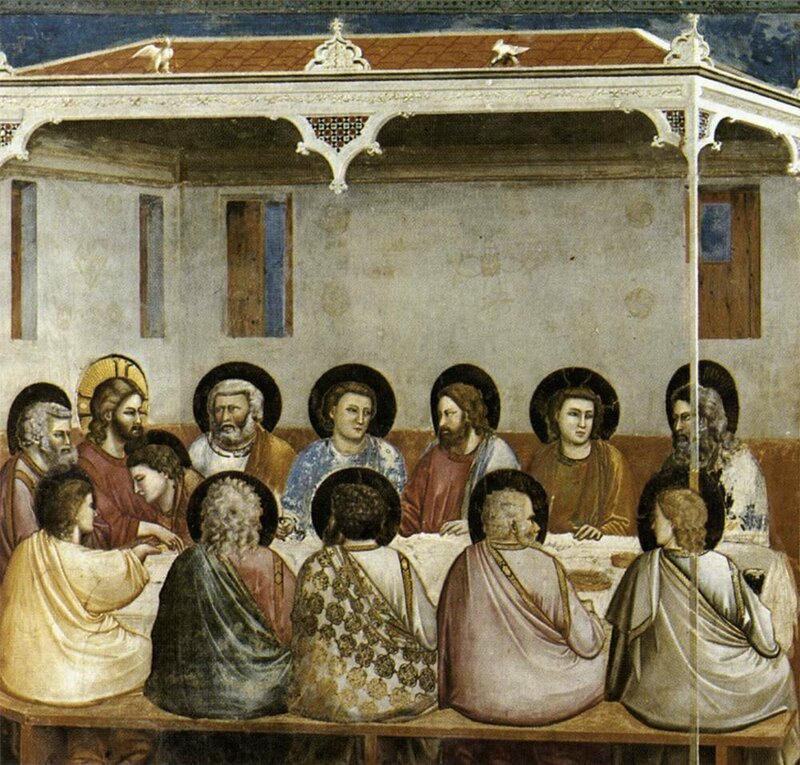 According to the other three evangelists Our Lord’s last supper was a traditional Pascal feast into which he inserted the novelty of the gift of His body and blood. Until very recently this contradiction seemed irresolvable. Most of the exegetes were of the opinion that John did not want to give us the exact, historic date of Christ’s death, but had instead chose a symbolic date to highlight the one profound truth: Jesus is the true Lamb of God who shed his blood for us”. “In the meantime the discovery of the Qumran writings has led us to a possible and convincing solution that, while not accepted by all, possesses a great degree of probability. We are now able to say that John’s account of the passion is historically precise. Christ really did shed his blood on the eve of the Passover at the hour of the slaughter of the lambs. However he celebrated Passover with his disciples according to the Qumran calendar, therefore at least one day earlier – he celebrated it without lamb, as according to the traditions of the Qumran community, which did not recognise Herod’s temple and was waiting for a new temple. Christ therefore celebrated Passover without the lamb: no, - not without the lamb: in place of the lamb he gifted his body and blood. Thus He anticipated the death with his words: “No one takes my life from me, but I lay it down on my own”. At the very moment He gives his body and blood to the disciples, He really is bringing his words to be. He himself offers His life. Only in this way does the ancient Passover obtain true meaning”. 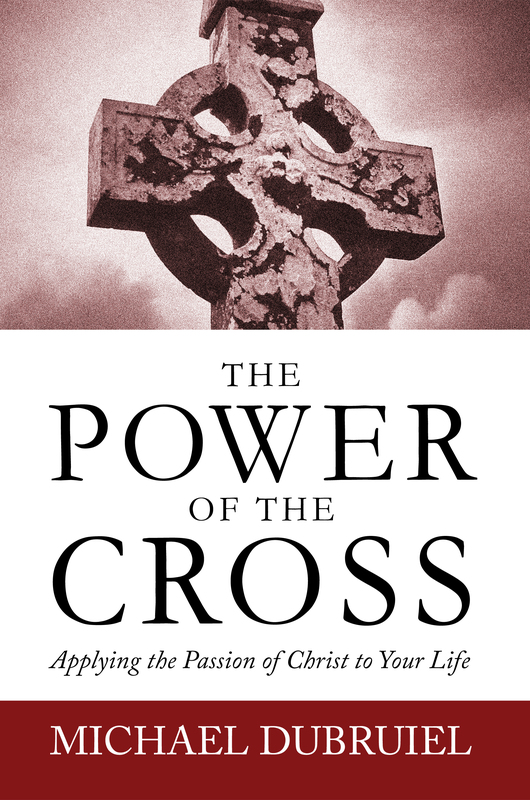 “Thus –concluded the Pope – at the very heart of Christ’s new Easter is the cross. From the cross comes His gift to us. His body and His blood. In the blessed Eucharist, we celebrate together with the Apostles, down through the centuries, our new Easter. This gift comes from Christ’s cross”. In the center of the story of the Good Samaritan is man's fundamental question. It was a doctor of the law - a master of exegesis - who asked it of the Lord: "Rabbi, what should I do to gain eternal life?" (10,25). Luke adds that the doctor asked the question to put Jesus to the test. He himself, as a doctor of the law, knew the answer the Bible gives to that question, but he wanted to see what this prophet, who was not a Biblical scholar, would say about it. The Lord simply refers him back to the Scripture that his interlocutor knows and lets him answer his own question. The doctor of laws answers by precisely citing Deuteronomy 6,5 and Leviticus 19,18: "Love the Lord God with all your heart, all your spirit, all your strength, and all your mind, and love your neighbor as much as you love yourself" (Lk 10.27). On this question, Jesus does not teach things differnt from the Torah, whose entire meaning is contained in this double commandment. But now, this learned man, who knew the answer to his own question, had to justify himself further: The word of the Scripture is not in question, he says, but how it should be applied in life raises many questions that are debated in the schools (and even in life itself). The question is: Who is our 'neighbor'? The usual response, based on Scriptural texts, says 'neighbor' means 'fellow national(tribesman)". "as himself" - part of that whole which assigns him a vital space. Then what about strangers, those who belong to another 'people', aren't they 'our neighbors'? Scriptures exhorted the Jews to love even strangers, reminding them that in Egypt, the people of Israel had lived as foreigners. But where to place limits remained a matter for discussion. In general, only the foreigner who lived on the land of Israel was considered to belong to the fraternal community. But other concepts of 'neighbor' were also widespread. So, to the question phrased in such a concrete manner, Jesus responded with the parable of the man who was attacked by brigands on the road from Jerusalem to Jericho and abandoned by the wayside, stripped of everything and half dead. It is a very realistic story because on that road, similar attacks occurred regularly. Along the road now came a priest and a Levite - both knowledgeable of the Law, experts on the great question of salvation, the service of which was their profession - and passed him by. They probably were not necessarily cold-hearted. Maybe they were afraid themselves and were in a hurry to reach the city; maybe they were inexperienced and did not know where to begin to give first aid - especially since, it seemed there wasn't very much one could do to help at this point. Next came a Samaritan, probably a merchant who had to travel this stretch of road often and evidently knew the owner of the nearest inn. A Samaritan - one who did not belong to the fraternal community of Israel and who was not expected to see his 'neighbor' in the man who had been attacked by brigands. We must remember that in the preceding chapter, the evangelist had narrated how Jesus, on the way to Jerusalem, had sent messengers ahead to a Samaritan village where they wanted to prepare lodgings for Him: "But they did not want to receive Him because he was going to Jerusalem" (9,52f). Infuriated, the Sons of Thunder, James and John, said to Jesus: "Lord, do you want us to tell them that a fire from heaven will descend to consume them?" The Lord reproved them, and they later found lodging in another village. And now comes this Samaritan. What would he do? He did not ask himself what were the limits of his obligation of brotherhood, nor what were the merits necessary to gain eternal life. Something else happens. His heart breaks. The Gospel uses a word which in Hebrew means the matrrnal womb and maternal dedication. If the question had been, "Is the Samaritan my neighbor, too? ", then in the given case, the answer would have been a clear No. But Jesus turns the question around: the Samaritan, the foreigner, considers himself the neighbor, and shows me that I myself, in my being, should learn what it means to be a neighbor, and that I already have the answer within me. I should become a person who loves, a person whose heart is open to being moved in the face of another person's need. Then I will find my neighbor; or better still, he will find me. Helmut Kuhn, in his interpretation of this parable, goes beyond the literal sense of the text but nonetheless correctly defines the radicalness of its message when he writes: "The political love of friends is founded on the equality between partners. Instead, the symbolic parable of the Samaritan underscores a radical imparity: the Samaritan, who does not belong to the people of Israel, finds himself in front of the other, an anonymous individual, (it is) he who will aid this helpless victim of an attack. "Agape, the parable lets us know, goes beyond any type of political order dominated by the principle of 'do ut des', replacing it, and characterizing itself thereby as something supernatural. In principle, agape does not just go beyond such orders but it overturns them: the first shall be the last (cfr Mt 19,30)(P 88f). "One thing is evident. (The parable) manifests a new universality based on the fact that I, within myself, am already a brother to all whom I meet and who may need my help." The actual relevance of the parable is obvious. If we apply it to the dimensions of the globalized society, then we will see how the people of Africa who have been robbed and pillaged concern us intimately. We will see how much they are our neighbors. We will see how our lifestyle, the history in which we are involved, has despoiled them and continues to despoil them. This includes above all how much we have harmed them spiritually. Instead of giving them God, the God who is near to us in Christ, and gathering from their traditions all that is precious and great and bringing them to fulfillment, we have brought them the cynicism of a world without God, in which only power and profit count. We have destroyed their moral criteria so that corruption and the will to power become obvious ends. And this does not apply to Africa only. Yes, we should give material aid and we should examine the life we lead. But we always give too little when we only give materially. Don't we see around us the man who is stripped and beaten? The victims of drugs, of human trafficking, of sexual tourism, persons whi have been damaged within, who are empty amid the abundance of material goods. All this concerns us, and calls on us to have the eyes and the heart of a neighbor, and the courage to love our neighbor. Because, as we said earlier, the priest and the Levite went by perhaps more out of fear than indifference. Let us learn anew, beginning with our intimate self, the risk of doing good, of which we will be capable only if we ourselves become 'good' inside, if we are 'neighbors', and if we have the ability to identify - within our immediate circle to the widest extension of our life - what type of service is required of us, what we can do, and therefore what responsibility is given to us. The Fathers of the Church gave the parable a Christological reading. Someone may say: this is an allegory, an interpreetation that goes far from the text. But if we consider that in all the parables, the Lord invites us, always in a different way, to have faith in the kingdom of God, that kingdom which is He Himself, then a Christological interpretation is never completely wrong. In a certain sense, (the interpretation) corresponds to a potential that is intrinsic in the text, the fruit that develops from its seed. The Fathers saw the parable in the dimension of universal history. The man who lies by the roadside half dead and stripped - is he not an image of Adam, of man in general, who truly 'has fallen victim to brigands'? Is it not true that man, this creature who is man, in the course of his whole history, has found himself alienated, tortured and abused? The great mass of humanity has almost always lived under oppression. On the other hand, are the oppressors the true image of man, or are they not the first deformed ones, a degradation of man? Karl Marx has described man's 'alienation' in a drastic way: Even if he never touched the true depth of alienation because he was only concerned with the material sphere, he nevertheless provided us an image of man who has fallen victim to brigands. Medieval theology interpreted the two adjectives in the aprable about the victim as fundamental anthropological statements. Of the victim of an ambush, one says, he was stripped (spoliatus); and that he had been beaten close to death (vulneratus; cfr Lk 10,30). Scholars refer to this two participles as the double dimension of man's alienation. They say of man that he is 'spoliatus supernaturalibus e vulneratus in naturalibus' - stripped of the splendor of supernatural grace, which had been given to him as a gift, and injured in his nature. Now, this is an allegory that certainly goes far beyond the sense of the words, but it represents an attempt to identify the double nature of the wound on humanity. The road between Jericho and Jerusalem thus appears as the image of universal history, and the man who lies half-dead by the roadside is an image of mankind. The priest and the Levite pass him by - as the story tells us - which means that culture and religion alone do not bring any salvation. And if the victim of the ambush is the image par excellence of mankind, then the Good Samaritan could only be the image of Jesus Christ. God himself, who is, for us, the stranger far removed, has come along to take care of His wounded creature. God the remote has become, in Christ, 'our neighbor.' He pours oil and wine on our wounds - a gesture in which one sees an image of the saving gifts of the sacraments - and he brings us to the inn, the Church, where we can be cared for, and He pays for our care in advance. We can calmly leave aside the single features of the allegory, which are different for each of the Fathers. But the great vision of man who lies alienated and helpless by the roadside of history, and of God himself, who in Jesus Christ, and became his neighbor - that we can safely keep in mind as the profound dimension of the parable which concerns us directly. The powerful imperative contained in the parable is not thereby weakened, but rather brought to its total grandeur. The great theme of love, which is the true culmination of the text, reaches its greatest breadth. Now, indeed, we must take note that we are all 'alienated' and needful of redemption. Now we must take note that we all need the gift of God's own redeeming love so that we too can become persons who love. We will always need God to be our neigbor, so that we in turn can be neighbors to our fellowmen. The two figures that we have discussed concern each one of us: every person is 'alienated', estranged from love (which is the essence of that 'supernatural splendor' of which we have been stripped). Every person must first be healed and provided with that gift. But then, every person too must become a good Samaritan - we must follow Christ and become like Him. Then we will live rightly. We will love rightly if we become like Him, who loved us first (cfr Jn 4,19). Dear brothers and sisters, The Russian writer Leo Tolstoi has a short story in which a stern king asks his priests and wise men to show him God, so he could see Him. The wise men were not able to satisfy the king's desire. Then, a shepherd who had just returned from the fields, offered to take on the task. He told the king that his eyes were inadequate to see God. Well, then, the king at least wanted to know what God does. "To respond to your question," said the shepherd, "we should exchange clothes." Reluctantly, but impelled by curiosity, the king agreed. He took off his kingly garments and put on the simple garment of the shepherd. Now, he had his answer. "This," said the shepherd, "is what God has done." Indeed, the Son of God - true God from true God - left behind his divine splendor: "...he emptied himself, taking the form of a slave, coming in human likeness; and found human in appearance, he humbled himself, becoming obedient to death, even death on a cross" cfr Phil 2,6ff). As the Fathers said, God underwent the sacrum commercium, the sacred exchange: he assumed that which is ours, so that we could receive that which is His, to become like Him. St. Paul, to describe what takes place at Baptism, explicitly uses the image of garment: "When you are baptized in Christ, then you become clothed in Christ" (Gal 3,27). This is what happens in Baptism: we are clothed again in Christ - He gives us His vestments, and these are not exterior. It means we enter into an existential communion with Him, that His being and ours flow together and compenetrate each other. "No longer I, but Christ, lives in me" - Paul says in his Letter to the Galatians (2,20), describing his own Baptism. Christ has put on our garments: the sorrows and the joys of being man, the thirst, the hunger, the tiredness, the hopes and disappointments, fear of death, all human anguish including death. And He has given us His 'garments.' What he presents in the Letter to the Galatians as the simple 'fact' of Baptism - the gift of new being - Paul describes in the Letter to the Ephesians as a permanent task: "... you should put away the old self of your former way of life... and put on the new self, created in God's way in righteousness and holiness of truth. Therefore, putting away falsehood, speak the truth, each one to his neighbor, for we are members one of another. Be angry but do not sin..." (Eph 4, 22-25). This theology of Baptism returns in a new way and with new insistence in priestly ordination. As in Baptism, there is an 'exchange of garments', a change of life, a new existential communion with Christ. In the priesthood, one undergoes a change: in administering the sacraments, the priest acts and speaks in persona Christi. In the sacred mysteries, the priest does not represent himself, he does not speak to express himself, he speaks for the Other - for Christ. So the Sacraments make dramatically visible what being a priest means, in general: what we expressed by our "Adsum" - I am here, I am ready - during our priestly consecration: I am here so you may dispose of me. We make ourselves available to Him who "died for everyone, so that those who live no longer live for themselves" (2 Cor 5,15). To put ourselves at the disposition of Christ means we allow ourselves to be drawn into His 'for everyone' - being with Him, we can truly be 'for everyone'. In persona Christi – at the moment of sacerdotal ordination, the Church made visible and tangible for us the reality of 'new garments' even externally, through being clothed in liturgical vestments. In this external fact,she wants to make evident the interior event and the task that comes from it: to be clothed in Christ, to give ourselves to Him as he gave Himself to us. This event, this clothing ourselves in Christ, is represented anew every time we vest ourselves for Holy Mass. To put on the liturgical vestments should mean more than the external fact: it means entering anew into the Yes of our responsibility, that "no longer I" in Baptism which priestly ordination re-confers on us but at the same time demands of us. The fact that we are at the altar, dressed in liturgical vestments, should make visibly clear to to those present that we are there "in the person of Another." 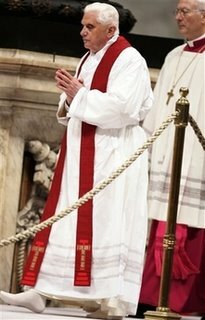 Priestly vestments, as they have developed in the course of time, are a profound symbolic expression of what the priesthood means. Therefore, dear brother priests, I would like to explain on this Maundy Thursday, the essence of the priestly ministry by interpreting the liturgical vestments which, precisely, are meant to illustrate what it means to be 'clothed in Christ', to talk and to act in persona Christi. Putting on the priestly garments was at one time accompanied by prayers which help us to better understand the single elements of the priestly ministry. Let us start with the amice. In the past - and even today, among the monastic orders - it was first placed on the head, like a hood, as a symbol for the discipline of the senses and thought that is necessary for the proper celebration of the Mass. My thoughts should not wander to and fro among the concerns and expectations of my daily routine. My senses should not be drawn to anything within the Church that may casually catch the eye or the ear. My heart should open itself obediently to the Word of God and reflect on the prayers of the Church, so that my thought may be oriented by the words of the Gospel and the prayers. And the eye of my heart should look to the Lord who is in our midst: that is what ars celebrandi means - the proper way of celebration. If I am with the Lord, then my listening, speaking and acting will also draw the faithful into communion with Him. The texts of the prayers interpreting the alb and the stole are along the same line. They recall the festive garment that the Father gave the prodigal son when he returned home in dirty rags. When we take part in liturgy to act in the person of Christ, we all become mindful of how far we are from Him - how much filth there is in our lives. Only He can give us the festive garment, make us worthy to preside at His table, to be in His service. So the prayers also recall the words of the Apocalypse according to which the robes of the 144,000 elected ones were worthy of God, but not through their merit. The Apocalypse says that they had washed their robes in the blood of the Lamb, and in this way, the garments had become as candid as the light (cfr Ap 7, 14). As a child, I asked: But when one washes something in blood, it certainly does not become white. The answer is that 'the blood of the Lamb' is the love of the crucified Christ. That love makes our dirty garments clean and white, it enlightens our shadowed spirit, so that notwithstanding all our personal shadows, it transforms us to be 'light in the Lord'. When we put on the alb, we should remember: He suffered for me. And only because His love is greater than all of my sins am I able to represent Him and be a witness of His light. But in the garment of light that the Lord gives us in Baptism and once again in priestly ordination, we can also think of the nuptial garment that he talks about in the parable of the wedding feast. In the homilies of St. Gregory the Great, I found a reflection worthy of note. Gregory compares Luke's version of the parable to that of Matthew. He is convinced that the parable inLuke refers to the eschatological wedding feast, whereas, the version transmitted by Matthew refers to the anticipation of that wedding feast in liturgy and in the life of the Church. In Matthew, and only in Matthew, the king comes into the crowded hall to see his guests. And among the multitude, there is one who is not in wedding clothes and is thrown out into the shadows. So Gregory asks: " What garment was he lacking? Everyone who has been received into the Church has received the new garment of baptism and the faith; otherwise, they would not be in the Church. What then was lacking? What nuptial garment must be added?" Pope Gregory answers: "The garment of love." And unfortunately, among the guests to whom he had earlier given new garments, the white garments of rebirth, the king found some who did not have the red robes signifying love for God and for one's neighbor. "In what condition do we wish to approach the heavenly feast," asks Pope Gregory, "if we do not put on the wedding garment - love, which alone can make us beautiful?" A person without love is dark within. The outer shadows that the Gospel speaks of are only a reflection of the interior darkness of the heart (cfr Hom. 38,8-13). And as we prepare ourselves to celebrate the Holy Mass, we should ask ourselves if we have this garment of love. We ask the Lord to drive away every hostility from our spirit, to rid us of any sense of self sufficiency, and to clothe us truly in the garment of love, so that we become creatures of light rather than belonging to the shadows. Finally, a brief word about the chasuble. The traditional prayer when one is putting it on sees it as a representation of the yoke which the Lord imposes on us as priests. And it recalls the words of Jesus when He invites us to carry His yoke, and to learn from Him, who 'mild and meek of heart' (Mat 11,29). To carry the yoke of the Lord means above all to learn from Him. To be always ready to 'go to school' by Him. From Him we should learn gentleness and humility - the humility God showed in becoming man. St. Gregory Nazianzene once asked why God wanted to become a man. For me, the most important and moving part of his answer was: "God wanted to experience what obedience means to man, and to measure everything according to His own suffering out of love for us. In this way, he would experience directly what we experience - what is asked of us, how much indulgence we deserve - measuring our weakness according to the measure of his suffering" [Dicourse 30: Disc. teol. IV,6). At times, we want to say to Christ: Lord, your yoke is by no means light. Rather, it is a very heavy one in this world. But then, looking at Him who has borne everything - who in Himself knew obedience, weakness, pain, all possible darkness - then, we stifle our cry. His yoke is for us to love with Him. The more we love Him, and with Him, become persons who love, then the lighter the yoke becomes, even if it seems heavy. Let us pray to Him to help us become, with Him, persons who love, so that we may experience ever anew how beautiful it is to bear His yoke. Amen. You call me Teacher and Lord; and you are right, for so I am. If I then, your Lord and Teacher, have washed your feet, you also ought to wash one another's feet. For I have given you an example, that you also should do as I have done to you. What Books People who Read Amy's Open Book blog and Michael's Annunciation blog are buying this month. This is how the media reports what is in a book about Jesus of Nazareth written by the Pope. It is based on how he sees a modern interepretation of Jesus' parable on the Good Samaritan...from Reuters. The pope, who pointed to the plight of those in Somalia in a speech to the international diplomatic community in January, will preside over the concelebration of the April 5 Mass of the Lord's Supper and will wash the feet of 12 men at the Basilica of St. John Lateran in Rome. The monies collected will be donated to the work of Caritas Somalia, the Catholic relief agency in that country. The conflict in Somalia has deteriorated in recent months, with Ethiopia being drawn into the fighting and the some of worst violence in the last 15 years. Scores of people have reported to have been killed in the Somalia capital, Mogadishu, in the clashes, and thousands have fled the city. "We are doubtful that these activities outside the parishes are real expressions of Christian faith," Monsignor Pedro Quitorio, Catholic Bishops’ Conference of the Philippines spokesman, told reporters Monday. 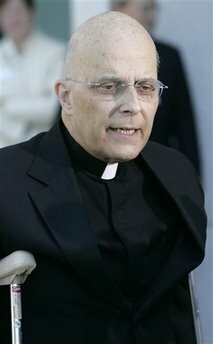 Peter A. Libasci--A Saint Meinrad alumn (as I am...of the college for me). For a long time, he had been preparing himself for this last encounter with Jesus, as the different drafts of his testament show. During long hours in his private chapel, he spoke to Him, abandoning himself totally to His will, entrusting himself to Mary, repeating Totus tuus. 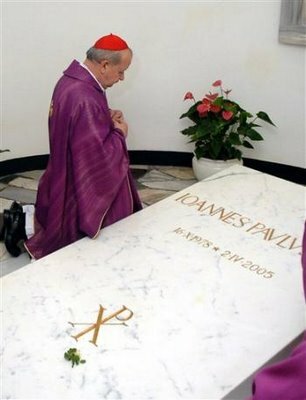 Like His divine Master, He lived his agony in prayer. On the last day of his life, eve of the Sunday of Divine Mercy, he asked to be read the Gospel of John. Assisted by those around him, he wanted to take part in all the prayers of the day and at the Liturgy of the Hours, to make Adoration, to meditate. The perfume of the Pope's faith and hope and love filled his house, filled St. Peter's Square, filled the Church and spread throughout the whole world. He died praying. Truly, he went to sleep in the Lord. What happened after his death was - to believers - the effect of that fragrance that had reached everyone, near and far, and drew them towards a man whom God had progressively conformed to Christ. And so we can apply to him the words of the first verse of the Servant of the Lord that we heard in the first Reading: "Here is my servant whom I uphold, my chosen one with whom I am pleased, upon whom I have put my Spirit; he shall bring forth justice to the nations,..."
Dear brothers and sistes, the Responsorial Psalm has given us words full of faith. In the communion of saints, we seem to hear the voice of of our beloved John Paul II, who from the house of the Father - we can be sure - does not cease to accompany the journey of this Church. "Wait for the Lord with courage; be stouthearted, and wait for the Lord. (Ps 26. 13-14).